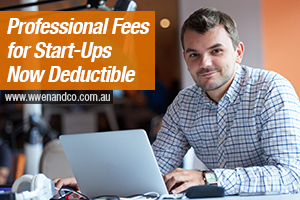 Start-up small businesses are able to deduct a range of expenses associated with launching their venture, such as the costs of professional, legal and accounting advice. When will these allowable deductions become effective? The government’s “Jobs and Small Business” package announced with the last budget and effective from July 1 2015, changes the previous rules where such costs were apportioned over a five-year period. If a small business owner accrues some professional costs related to starting their venture, such as costs for legal and accounting advice, these can be deducted in the same financial year. What business types does this rule affect? This applies to all eligible small businesses (turnover of less than $2 million a year). incurred in obtaining advice or services relating to the proposed structure or the proposed operation of the business. Such as professional fees in relation to setting up legal arrangement, performing due diligence and developing a business plan. However, it does not include the cost of acquiring assets that may be used by the business. a payment to an Australian government agency of a fee, tax or charge incurred in setting up the business or establishing its operating structure. For example, fees for creating a company and the payment of stamp duty for transfer of assets. It does not include expenditure relating to general taxes, such as income tax.